After locking, the login screen shows the message "Authentication Failure" and the user must click "Switch to greeter" to continue. This SRU fixes the regression introduced in 44e6022, which causes the lock screen to start failing when session switching is involved. This can happen when you unlock the session from LightDM or from the CLI. We need to cancel the authentication in order to ensure that the next one does not fail. 2. Via upper-right menu switch to "alice". 3. On greeter screen select "alice", login under alice. 4. Logout, return to greeter screen. 5. Select bob (already logged in). Enter password. This happens mostly after switching user sessions. Jan 6 17:15:42 eugene-Lenovo-Flex-2-14 compiz: WARN 2018-01-06 17:15:42 unity.lockscreen UserPromptView.cpp:500 Failed to start the authentication process. Retrying for 2 time. Anyone know either the cause, or a solution? If it helps, the two computers where I'm seeing this also happen to be the two host computers where I run Virtualbox. My issues began shortly after upgrading from 16.10 -> 17.10. Most of my issues related to graphical components so perhaps it was related to the switch to Wayland? ...as for a fix - I ended up reformatting my machine with a fresh 17.10. Haven't seen any of the issues since. for a list of other issues to happen at the same time. Same on 16.04.3 after updating Unity to latest proposed packages. Also on 17.10 with installed unity-session. For me, this issue appears after switching to another user. 3. On greeter screen setect "alice", login under alice. 6. Lock screen. Issue appeared. Issue appeared on every screen lock. Jan 6 17:15:33 eugene-Lenovo-Flex-2-14 systemd: Stopped Backing Service for the Unity Panel in Lockscreen mode. Jan 6 17:15:42 eugene-Lenovo-Flex-2-14 compiz: WARN 2018-01-06 17:15:42 unity.lockscreen UserPromptView.cpp:500 Failed to start the authentication process. Retrying for 1 time. Jan 6 17:15:42 eugene-Lenovo-Flex-2-14 systemd: Started Backing Service for the Unity Panel in Lockscreen mode. Jan 6 17:15:42 eugene-Lenovo-Flex-2-14 systemd: Reached target A target that, when running, represents the screen being locked. Jan 6 17:15:42 eugene-Lenovo-Flex-2-14 compiz: WARN 2018-01-06 17:15:42 unity.lockscreen UserPromptView.cpp:500 Failed to start the authentication process. Retrying for 3 time. Jan 6 17:15:42 eugene-Lenovo-Flex-2-14 compiz: WARN 2018-01-06 17:15:42 unity.lockscreen UserPromptView.cpp:500 Failed to start the authentication process. Retrying for 4 time. Jan 6 17:15:42 eugene-Lenovo-Flex-2-14 compiz: WARN 2018-01-06 17:15:42 unity.lockscreen UserPromptView.cpp:500 Failed to start the authentication process. Retrying for 5 time. Same as Eugene, the problem started popping up after upgrading Unity. When I lock my screen or wake from suspend, I get the described behaviour. As a temporary fix, is there a way to just skip that screen and always go to the greeter when locking the screen or suspending? P.S. : To be precise, the message I get is not "Authentication failed", but "Authentication failure". This may be related to my system language being German. I'm seeing this also upon 17.10 upgrade in unity / lightdm / unity greeter. It doesn't happen 100% of the time, typically takes some time time to manifest (I only ever suspend my laptop from monday to friday), but once it starts happening, it always happens until I shut down. Appears on 16.04.3 after updating Unity to latest packages. Screenshot from virtualbox test install. For me, in an Ubuntu 16.04, happends every time I lock (or my laptot sleeps) and the login screen appears. It seems that it happends since I've installed virtualbox 5.4? > It seems that it happends since I've installed virtualbox 5.4? Sure no, it just since latest unity update was landed in 16.04. In artful and bionic this issue reproduceable if lightdm used as display manager. This just started happening to me in 16.04 LTS. Not fatal, but annoying. FYI, I use a KVM switch on one of two monitors connected to Ubuntu. - I had account for my wife, created on the machine, but she has not used it ever. - today she logged in with her account. - after she logged out the bug was present, when I attempted to log in. Now when I Lock/Switch Account the bug is produced. Sometimes I think Unity developers never use Unity actually, as this issue immediately visible when you share home PC with wife and children (assuming they have separate accounts). It depends on the hardware/graphics. But as I said, I can't reproduce it on bionic (bionic has different unity/lightdm version). Can you reproduce it in a live iso? > It depends on the hardware/graphics. Sure, no. I tested and have this issue on home PC (16.04.3 after latest Unity update, AMD Phenom CPU/Nvidia GPU), work PC (17.10, Intel i7/Intel), Lenovo flex laptop (17.10, intel i5), and of course in VirtualBox (16.04.3 fresh install with latest updates, 18.04). > But as I said, I can't reproduce it on bionic (bionic has different unity/lightdm version). Can you reproduce it in a live iso? Reboot, login as first user, start second user session, end session, return to first user session, lock screen - issue here. Bionic live iso does not have unity and lightdm preinstalled, so them will be downloaded from repository anyway. In my case, I've installed virtualbox-dkms 32bits, in host "Ubuntu 16 64bits", instead than in the virtualbox hosted "Ubuntu 16 32bits"
When I've removed those 32bits libs the problem disappeared. It started to happen to my laptop today after I did an upgrade. I can confirm the same is also happening on my notebook. Everything was fine up to about 2-3 weeks ago. I reckon it has something to do with the nVidia Driver. I started encountering this issue also. My system was working fine up until yesterday when this started happening. I most often notice it when I connect my laptop to an external display (or make some other display related change that kicks me to the login prompt). I have this problem starting from today when I locked my laptop with win+L. I confirm the occurrence of this bug since yesterday. Just began to experience it after last batch of system updates. I have Virtualbox running as well. I'm not switching between users. Just standby and resume. Here are some parts of several logfiles. Mar 12 16:36:45 BN systemd-logind: New session c32 of user lightdm. Mar 12 16:36:45 BN lightdm: pam_succeed_if(lightdm:auth): requirement "user ingroup nopasswdlogin" not met by user "bart"
same here, experiencing this until 2018-03-08 on my DellXPS 13 with latest i7 gen. (8.). I'm the only user of this computer. There is only my user and admin is disabled. I use Virtual Box and it was upgraded recently to Version 5.1.34 r121010 (Qt5.5.1). If I lock screen it don't happens immediately. It happens only after screen goes blank. Then I have to click on "switch to greeter" in password field and wait some seconds to screen changes and I be able to insert password. Mar 13 16:59:10 ...hostname... systemd-logind: New session c6 of user lightdm. Mar 13 16:59:10 ...hostname... lightdm: pam_succeed_if(lightdm:auth): requirement "user ingroup nopasswdlogin" not met by user "...user..."
I have this problem after installing updates yesterday. Looks like like how Eugene shows in comment #10. The attachment contains the data logged in x-0.log, seat0-greeter.log, lightdm.log, and x-1.log in the /var/log/lightdm directory during a test. I pressed CTRL-ALT-L, waited 10 seconds, clicked "Switch to greeter...", waited 10 seconds, then logged in and stopped recording. There is a DBus error, but not much else. Same here, happens since I installed updates on my 16.04 system yesterday. Never had this before. Uisng STRG-L to lock the screen frequently. I had this on my 16.04 system and it was INFURIATING - was taking 30s or so to login after a lock screen. back to normal :) ( for the last 3 locks at least... fingers crossed! Update to #37 and #38 reporting the issue on 16.04 LTS: The issue went away as silently as it initially came. Ran another apt update/upgrade today, totally different packages updated and then rebooted. 'Authentication Failure' in the lock screen is now gone, even after several reboots. Hi. I also have this problem on my DELL Optiplex AIO 9010 running Ubuntu 16.04.5 LTS. And "Yes I know that 16.04 is no longer supported" ... however it seems that if you upgrade to 18.04, it does not solve the problem and in fact makes it worse !! At the moment, I get this message after my desktop has been sleeping, click on it and the usual login prompt appears whereas with 18.04 it seems that we cannot switch to the login screen without pressing CTRL-ALT-F1. "After locking screen there is no input field to type password for unlock"
Having no input field is worse. @angela: I tested and it doesn't work. It had the same effect as restart or restart unity/compiz plugin: it'll work only until log with second user and suspend, then error is back. This bug happens to me also. I had this problem in my laptop during a few months. But it disappeared after a while. Now it suddenly appeared on my desktop. 16.04 LTS. I dont have other users in my computers as others mentioned. It happened after a few weeks of a fresh Ubuntu installation. Annoying but not serious. It happens after returning from screen lock or restart. Disappears after doing "ESC". I 've got this bug after "apt-get dist-upgrade" on my system too. User A try to login. If click Swith to Greeter it witll allow you to login and then it is back. I also experience the same problem on a fresh Ubuntu 16.04.5 LTS install. Fresh meaning: installed 6 days ago, in the meantime had to do 'sudo apt install --reinstall ubuntu-desktop'. Since then, I'm having this issue every time I lock my screen. Same issue on Ubuntu 18.04 LTS using Unity / lgihtdm / Compiz. Every time I lock the screen, I have to "switch to greeter" as it shows. So...Any solution to fix this now? I'm not sure if the information below would help. Dec 25 14:54:05 gadflysu-ubuntu systemd-logind: New session c7 of user lightdm. Dec 25 14:54:06 gadflysu-ubuntu lightdm: pam_succeed_if(lightdm:auth): requirement "user ingroup nopasswdlogin" not met by user "gadflysu"
Dec 25 14:54:41 gadflysu-ubuntu systemd-logind: Removed session c7. @c4pp4 is the attached patch file a solution? My solution is to terminate the PAM transaction and let it try to init the new one. I have tested it in my case and it works without problem. I wonder why there is the case of error - "Unable to start authentication because another one has already been started". I don't know what case it's related to. The attachment "authentication.patch" seems to be a patch. If it isn't, please remove the "patch" flag from the attachment, remove the "patch" tag, and if you are a member of the ~ubuntu-reviewers, unsubscribe the team. Please test if it works with multiple users. If it does it's better to attach a git patch with proper header. git commit -a -m "<your specific message>"
Then you will have a 0001-*.patch in root project dir. I have tested it with multiple users without problem. I have tweaked it little bit. How can I apply the patch? Or should I wait for it to be upstream and available via apt upgrade? I am on Ubuntu 18.04 and 18.10 with same multi-user problem. I'm adding the PPA to my install in order to test. Now almost 2 days using: I've resumed from suspend, switched users, and still working fine! Hope we can get this published soon! Thank you @c4pp4! Ok, after install the PPA, this issue is gone. No reboot since 19th, and several users used my box, I've suspend and resumed: working like a charm. Now how can we get this patch as an official update? As of now Unityshell compiz plugin is crashing in disco (bug 1812964), once that's fixed I will open a merge. @c4pp4 any chance providing a ppa for cosmic? As you wish, it's ready now. @c4pp4 because of other issues I had in my system (Firefox acting weird with recent 64 and 65 releases on 18.10) i rolled back to 18.04 (using LVM and backups) and installed your PPA - it also solved my long lasting issue with multiple logged-in accounts. Thanks! Perfect! Is it backported to 18.04 and 18.10? A friendly reminder it affects 16.04 too (aside 18.04 and 18.10). Accepted unity into cosmic-proposed. The package will build now and be available at https://launchpad.net/ubuntu/+source/unity/7.5.0+18.10.20190304-0ubuntu1 in a few hours, and then in the -proposed repository. That's great news! Does it mean it will be backported into bionic after it will be accepted from proposed? Is there a way to enable proposed for 18.04? I can no longer reproduce the problem in Cosmic following the steps in [Test Case]. I'm running Unity 7.5.0+18.10.20190304-0ubuntu1. Marking as verification-done. @sil2100 Any chance we get a build for Xenial and Bionic? 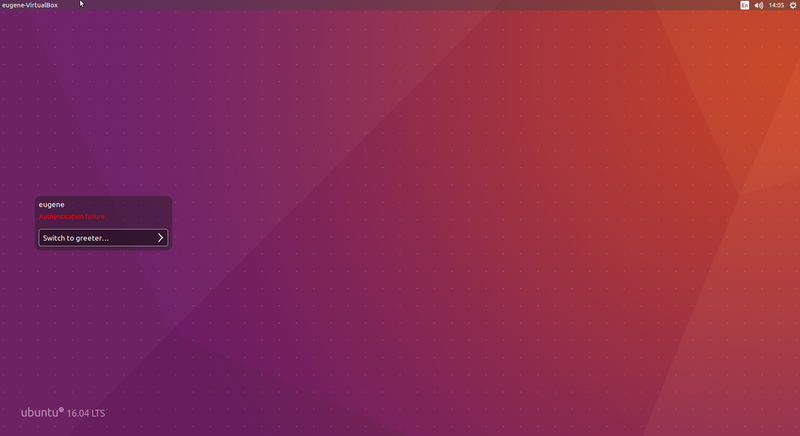 I've started seeing this bug in Ubuntu 16.04 recently. Accepted unity into bionic-proposed. The package will build now and be available at https://launchpad.net/ubuntu/+source/unity/7.5.0+18.04.20190304-0ubuntu1 in a few hours, and then in the -proposed repository. Accepted unity into xenial-proposed. The package will build now and be available at https://launchpad.net/ubuntu/+source/unity/7.4.5+16.04.20190312-0ubuntu1 in a few hours, and then in the -proposed repository. I have accepted Andrea's fixes to both xenial-proposed and bionic-proposed - could you please perform validation? Thank you! Unsubscribing the sponsors team, as there is nothing left to sponsor. Displaying first 40 and last 40 comments. View all 145 comments or add a comment.